The Upper Columbia River Bike & Run is a fun and family-friendly day of fitness that raises funds for our school. We offer an assortment of easy or strenuous (your choice!) events in a beautiful outdoor setting. Or compete in our classic Bike & Run. 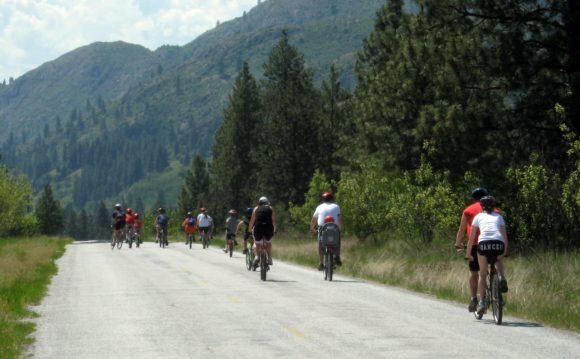 The Classic Bike & Run event is a short 10-mile bike ride along the beautiful Columbia River and a 2-mile run on a smooth dirt road. The event is very friendly for those who have never competed before and for those who like to crush their adversaries under their athletic boot. This is our sixth year organizing a Bike and Run and we are extremely excited that you are interested in participating. All monies raised help us offer for our many educational and healthy events. We operate ENTIRELY with volunteers so NO part of your money is going to administration, staff, or myself. Your payment helps us offer other events at free or reduced costs. The Northport community thanks you. Online Payment: After registering, follow the link that will show up after you submit your registration form. In consideration of my participation in the Upper Columbia River Bike & Run on May 17th, 2014 at Northport Air Strip, Flat Creek and Sheep Creek road, I hereby release the Northport Lions Club and SMOS, their agents, executives, members, and any other people officially connected with this event, from any and all liability from damage to or loss of personal property, sickness or injury from whatever source, legal entanglements, imprisonment, death or loss of money, which might occur while participating in this event. I understand that participation in this event is strictly voluntary and I freely chose to participate, and am aware of the risks of participation. I understand that the Northport Lions Club and SMOS does not provide medical coverage for me. I verify that I will be responsible for any and all medical costs I incur as a result of my participation.